Everyone has their own version of vegetable soup. Some use bags of frozen mixed vegetables, chopped meat or even noodles. My neighbor uses canned tomato soup as her base and a gal at our church includes beans. All of these versions are yummy, but I have a preference for fresh chopped vegetables, spices and pearl barley simmering in a good quality vegetable broth. Have you ever cooked with barley before? One of those ancient grains, the pearl version has the hull and bran removed to make it tender enough for soups, stews or porridge. When cooked down, the pearls have a puffed texture and give a chewy, almost nutty flavor. We love it this slow cooker vegetable barley soup recipe! 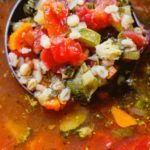 My recipe for vegetable barley soup is a favorite for company because I can prep it the day ahead and start it in the morning with a slow cooker. 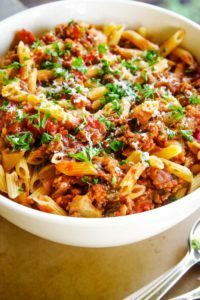 It will fill at least 10 hearty bowls or make enough leftovers for the week. 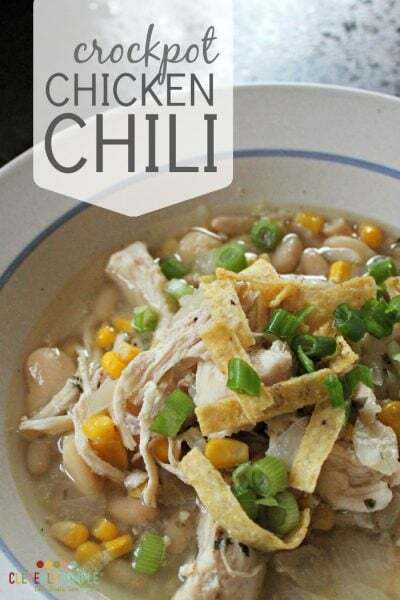 My children really enjoy the flavors of this soup as well – one of the best ways I can get them to eat a rainbow of vegetables! Paired with a side of crusty bread and cheese, it’s the perfect hot meal for those cooler autumn days. Are you ready to make my version of vegetable soup? Come on in to my kitchen! This soup uses seven different fresh vegetables. 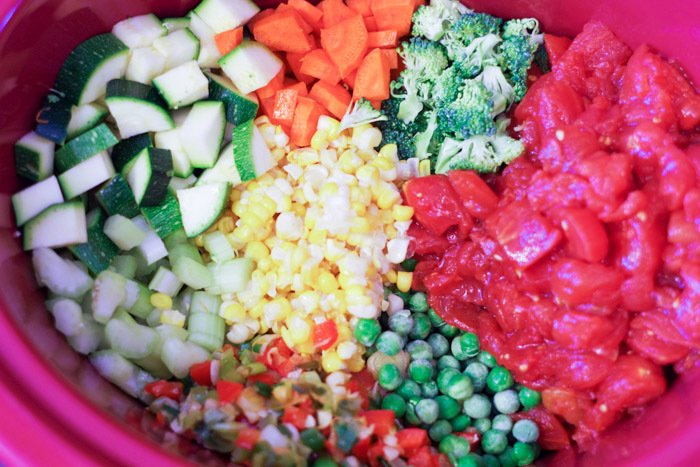 You will need green onions, red pepper, garlic, carrots, celery, broccoli, zucchini and frozen peas and sweet corn. Not pictured are canned diced tomatoes, fresh parsley and spices…and of course, pearled barley (which will come into play at the end). Before you bring your slow cooker out of the cupboard, sauté one bunch of chopped green onions (white and green parts) and three minced garlic cloves in a couple tablespoons of olive oil. One thing I have learned over the years is to always sauté the onions and garlic before adding them to your slow cooker. This will bring out the sweetness of the onion and flavor of the garlic. A must! Since this recipe also includes 1/2 cup diced red pepper, I am sauteing the pepper along with the onions and garlic. Once fragrant and tender, set them aside. 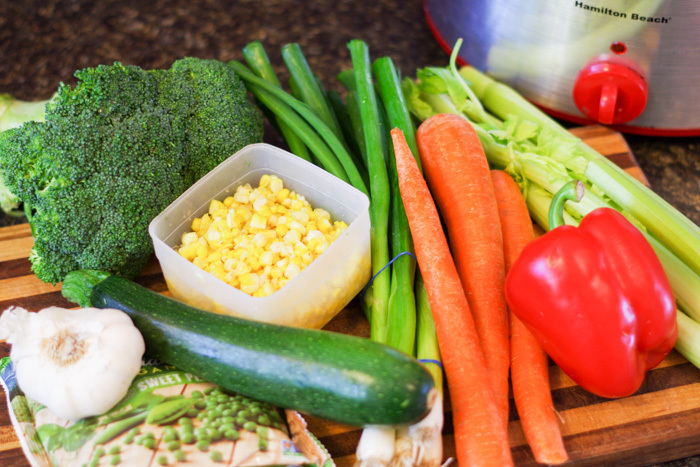 In your slow cooker, add your sautéed vegetables, 1 cup each of fresh chopped carrots, celery, broccoli and zucchini, 1/2 cup each of frozen sweet corn and peas and one 28 oz. can of diced tomatoes. Pour over 6 cups of good quality vegetable broth and stir it all together. As most of you know, I like to use Rapuzel Vegetable Bouillon with Herbs to make my broth. I find it here on Amazon. Now for the spices! 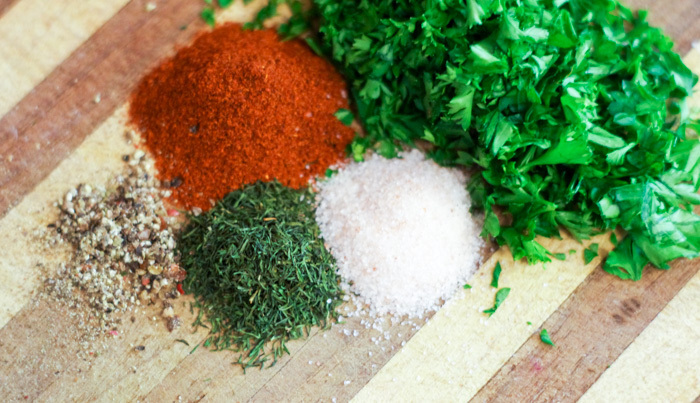 To your slow cooker, add 1 teaspoon Hungarian paprika, 1 teaspoon salt, 1/2 teaspoon dried dill weed, 1/4 teaspoon pepper and 1/4 cup chopped fresh parsley. You can use regular paprika if you don’t have Hungarian, but you will miss the sweetness! Stir it all together and cook on HIGH for 3 hours or LOW for 6 hours. By now, your kitchen will smell wonderful and your vegetables will be tender. It’s time to add our barley! It only takes a small time for the pearls to puff up and be tender so we don’t want it add them to our soup until the end. Here is what uncooked pearl barley looks like. Rinse 1/2 cup of pearls under water to remove any sentiments and drain. Add the rinsed pearls to your slow cooker and cook on HIGH for 1 additional hour or LOW for 2 additional hours. 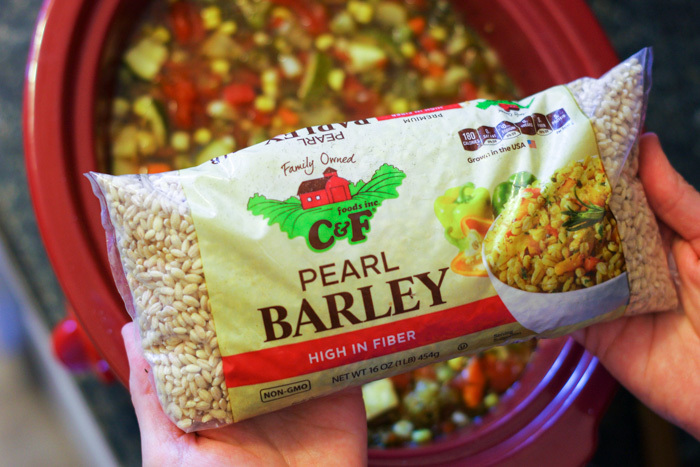 You might be thinking that 1/2 cup of pearled barley won’t be enough, but I assure you that once those pearls soak up some broth and incorporate themselves through the soup, you will see why we only need 1/2 cup! My friends, right here is what I love about fall cooking. 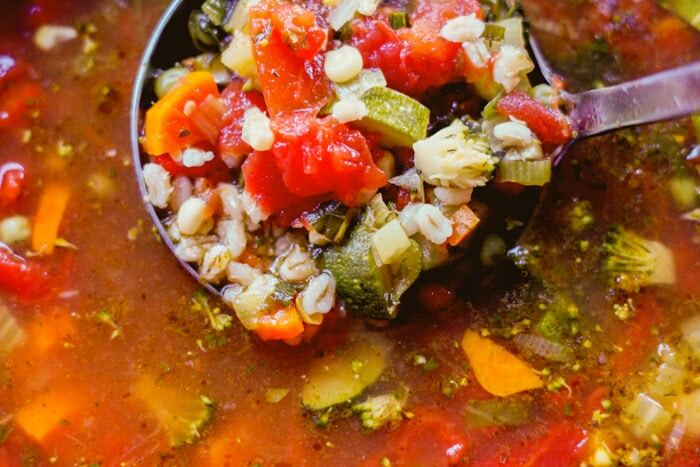 Full of flavor hot slow cooker vegetable barley soup. I hope you love this version as much as we do! 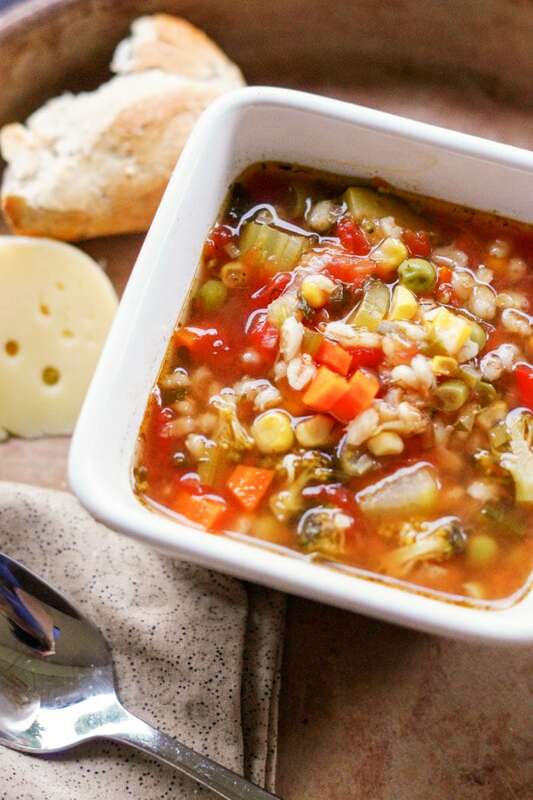 Slow cooker vegetable barley soup made with nine vegetables and pearl barley. 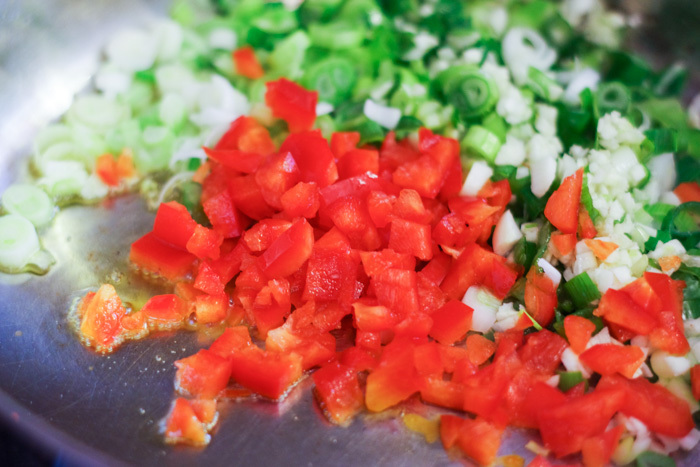 Saute 1 bunch of chopped green onions, 1/2 cup chopped red bell pepper and 3 cloves of minced garlic in 2 tablespoons of olive oil. 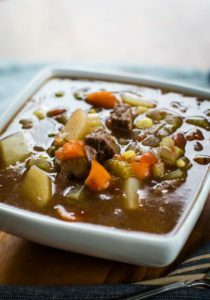 In your slow cooker, add the sautéed vegetables, 1 cup each of fresh chopped carrots, celery, broccoli and zucchini, 1/2 cup each of frozen sweet corn and peas and one 28 oz. can of diced tomatoes. Pour over 6 cups of good quality vegetable broth and stir it all together. Add 1 tsp. Hungarian paprika, 1 tsp. salt, 1/2 tsp. dried dill weed, 1/4 tsp. pepper and 1/4 cup chopped fresh parsley. 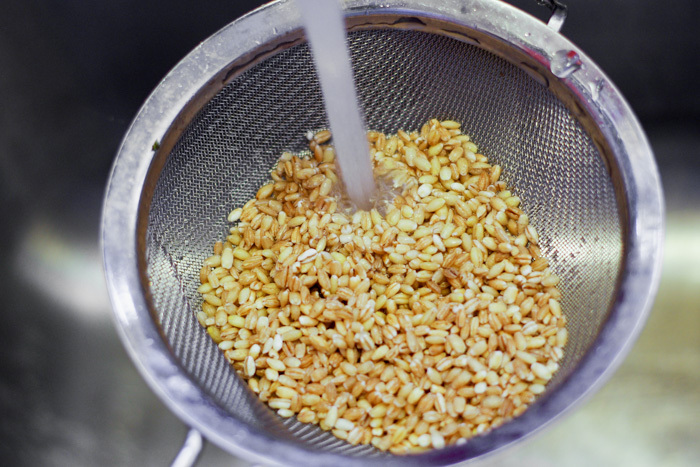 Rinse 1/2 cup of pearl barley under water and drain. 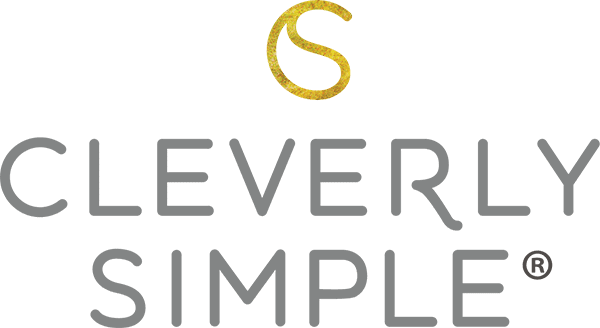 Add the rinsed pearls to your slow cooker and cook on HIGH for 1 additional hour or LOW for 2 additional hours. 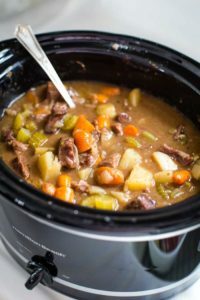 Can I use a Dutch oven instead of slow cooker ? 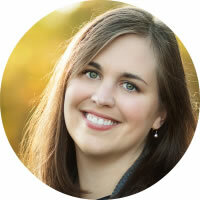 I search google for a recipe and to my wonderful surprise I find my old friend, Meredith!!!! It sounds delicious and I can’t wait to try it. Hope you and the family are doing well!